Vineyard Theatre (108 E. 15 St.) has announced the dates, creative team and leading actress for its next production – the new musical ARLINGTON by Victor Lodato and Polly Pen – with previews set to begin Wednesday, February 12 prior to its official opening night on Sunday, March 2, according to Douglas Aibel, Artistic Director, and Sarah Stern, Co-Artistic Director. Carolyn Cantor (THE GREAT GOD PAN, AFTER THE REVOLUTION) will direct ARLINGTON, which will feature set design by Dane Laffrey, costume design by Jess Goldstein, lighting design by Tyler Micoleau, and sound design by Dan Moses Schreier. The Production Stage Manager is Colyn Fiendel. ARLINGTON will star Alexandra Silber (MASTER CLASS on Broadway with Tyne Daly) as Sara Jane, a young wife who valiantly tries to remain hopeful while her husband is away at war, despite a growing concern that something is not quite right. ARLINGTON has book and lyrics by the playwright and novelist Victor Lodato and music by Polly Pen. Polly Pen has a long and fruitful relationship with The Vineyard, where her acclaimed musicals GOBLIN MARKET, BED AND SOFA and CHRISTINA ALBERTA’S FATHER all had their debuts. BED AND SOFA earned Ms. Pen an Obie Award, and the production received seven Drama Desk nominations, while GOBLIN MARKET received five Drama Desk nominations and transferred to a commercial run Off-Broadway. Ms. Pen’s other works include THE NIGHT GOVERNESS (McCarter Theatre), HER LIGHTNESS (Sarasota Opera), THE DUMB CAKE (a radio musical for NPR), and EMBARRASSMENTS (Wilma Theatre). Victor Lodato’s play 3F, 4F received its world-premiere at the Magic Theatre, as did his play THE EVICTION, which received the Roger L. Stevens Award from the Kennedy Center. A Guggenheim Fellow, his plays MOTHERHOUSE, WILDLIFE, DEAR SARA JANE, THE BREAD OF WINTER, MARGO AND ZELDA and SLAY THE DRAGON have been performed variously at the Humana Festival, Ensemble Theatre of Cincinnati and Summer Play Festival/NYC along with workshops and readings of his works at Manhattan Theatre Club, American Conservatory Theatre and The Guthrie. A poet and novelist as well as a playwright, Lodato’s writing has appeared in numerous periodicals including The New Yorker. His first novel, “Mathilda Savitch” has been translated into 13 languages. Alexandra Silber made her Broadway debut in MASTER CLASS starring Tyne Daly, having performed in that production at The Kennedy Center. She received critical acclaim for her roles in London’s West End productions of THE WOMAN IN WHITE, as Hodel in FIDDLER ON THE ROOF, and as Julie Jordan in CAROUSEL, for which she received Great Britain’s TMA Award for Best Performance in a Musical. Ms. Silber reprised her performance in CAROUSEL for the Reprise Theatre Company in L.A. earning an Ovation nomination. She made her New York debut as The Young Wife in the Transport Group’s revival of Michael John LaChiusa’s musical HELLO AGAIN, receiving a Drama League nomination, and made her Carnegie Hall debut in April 2013 as Nina in SONG OF NORWAY with the American Symphony Orchestra, followed by her San Francisco Symphony debut as Maria in concert performances and a recording of WEST SIDE STORY. She was part of Barbara Cook’s Spotlight Series at the Kennedy Center in December 2011 and has debuted two solo cabaret shows, “London Still” and “Ex Libris”, at Feinstein’s. Carolyn Cantor’s directing credits in New York include THE GREAT GOD PAN (Playwrights Horizons), CORE VALUES (Ars Nova), THE TALLS (Second Stage), AFTER THE REVOLUTION (Playwrights Horizons), PUMPGIRL (Manhattan Theatre Club) IN A DARK HOUSE (MCC Theater), SOMETHING YOU DID (Primary Stages), ESSENTIAL SELF DEFENSE (Playwrights Horizons), ORANGE FLOWER WATER (Time Out NY 10 Best of the Year), COLD DEAD SERIOUS (NY Times 10 Best of the Year), LIFE IS A DREAM (Edge Theater), EVE-olution (Cherry Lane) and KITTY KITTY KITTY (SPF). She is the Founding Artistic Director of the Obie Award-winning Edge Theater in NY. An inaugural version of ARLINGTON was commissioned and presented by PREMIERES in New York City; Paulette Haupt, Artistic Director. The full-length version of ARLINGTON had its world-premiere last month at the Magic Theatre in San Francisco. 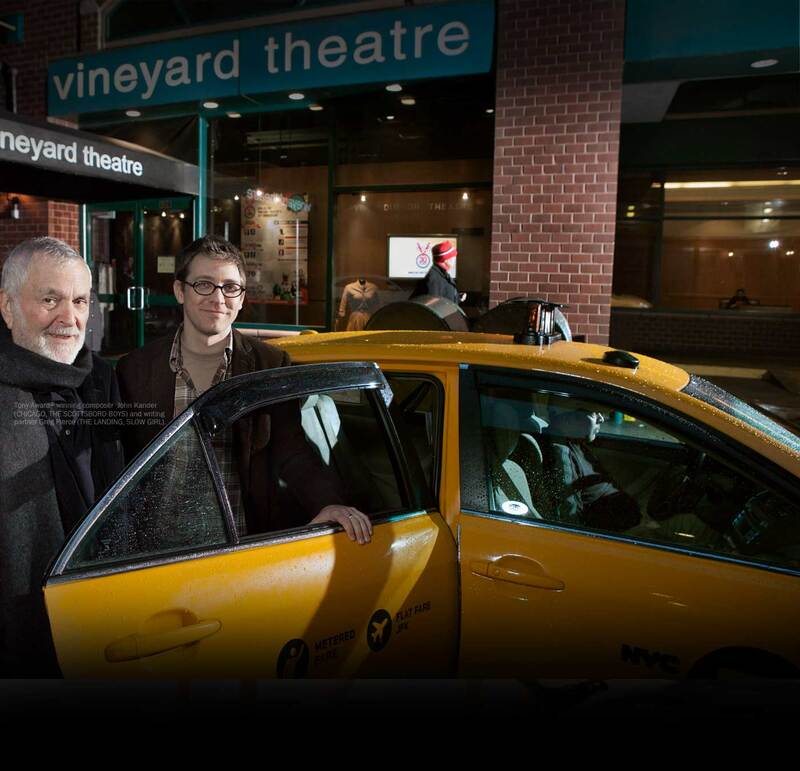 Vineyard Theatre is one of the nation’s leading non-profit theatre companies, now in its 31st year. Dedicated to the creation and production of daring new plays and musicals, The Vineyard has consistently premiered provocative, groundbreaking works, including Nicky Silver’s THE LYONS; Marx, Lopez and Whitty’s Tony Award-winning musical AVENUE Q; Kander and Ebb’s THE SCOTTSBORO BOYS; Bell and Bowen’s [title of show]; Paula Vogel’s HOW I LEARNED TO DRIVE (1998 Pulitzer Prize); Edward Albee’s THREE TALL WOMEN (1994 Pulitzer Prize); Tarell Alvin McCraney’s WIG OUT! ; Will Eno’s MIDDLETOWN, and many more. The Vineyard’s productions have been honored with two Pulitzer Prizes, three Tony Awards, and numerous Drama Desk, OBIES, Outer Critics Circle and Lucille Lortel Awards. The Vineyard recently concluded its world-premiere production of THE LANDING, the new musical by John Kander and Greg Pierce, and this spring will debut Nicky Silver’s newest play, TOO MUCH SUN, directed by Mark Brokaw. This summer and fall, The Vineyard had the unique distinction of having four of its productions debut in London: A BOY AND HIS SOUL, [title of show], THE SCOTTSBORO BOYS and THE LYONS. The Vineyard Theatre’s leadership includes Douglas Aibel (Artistic Director), Sarah Stern (Co-Artistic Director), Jennifer Garvey-Blackwell (Executive Producer). Tickets will be available for member booking in mid-December and go on sale to the general public January 6, 2014. For performance and ticket information to ARLINGTON, call The Vineyard box office at 212 353 0303 or visit www.vineyardtheatre.org.